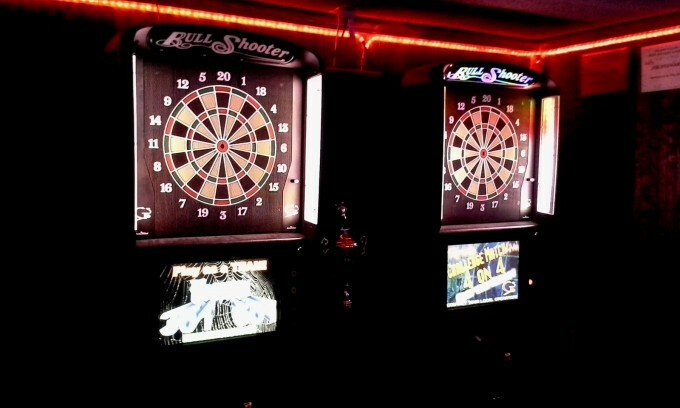 Play darts all night at the Skydive Lounge, we have 3 full sized soft tip dart machines as well as free rental darts up at the bar. These machines will accept any soft tip sized darts so you can bring your custom soft tip darts as well. Each machine has a variety of games but the most common are 301-701 and Cricket. These machines are up kept with proper care and always in great working condition. Many league players come into the Skydive Lounge for practice plus there is always a good pool of dart players if you ask around. If you come in as a single player, just ask the bartender if there are any player that are in or that come in and they will direct you to players that are more than willing to throw some darts with you. Skydive Lounge also has darts, accessories, tips, and other spare parts for sale in our darts retail case. If you need a place to stop in for quick equipment check or tips then Skydive is a great place to do that at. The Skydive Lounge also offers 2 darts leagues, one on Monday and another on Wednesday. If you are interested in joining the league just speak to one of our courteous bartenders or managers and they can direct you to the proper channels.